It has been a while since my last post. With the holiday season prep and all that, I have decided to give myself a wee break. Now that Christmas and new year are over and done with, time to turn my attention back here. 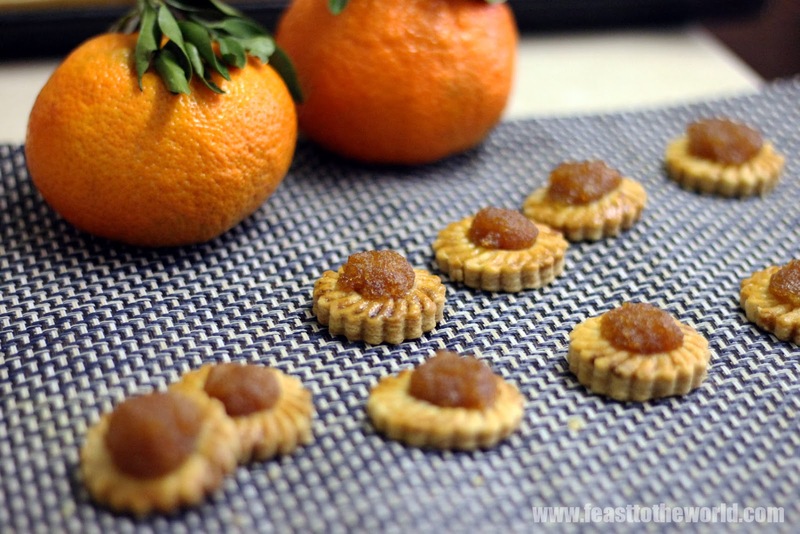 For the first post of the year, I am making some Chinese New Year baked goodies. 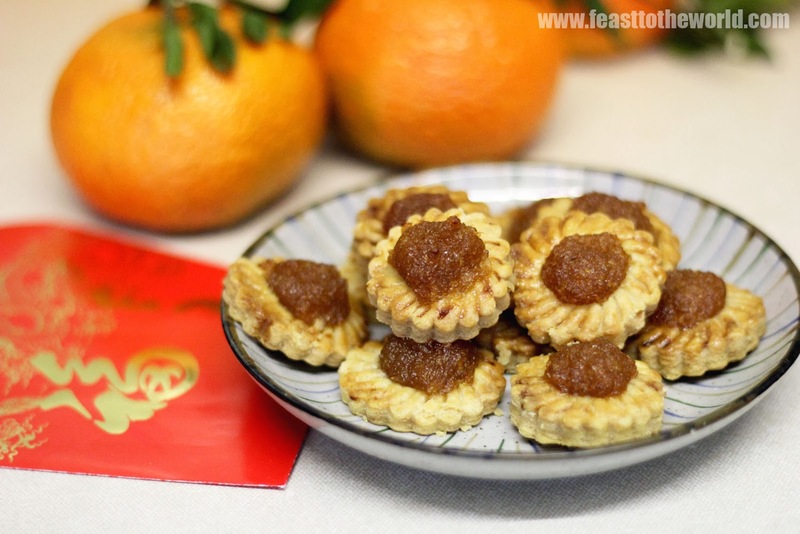 Pineapple tarts are very popular in Singapore and Malaysia over the new year celebration. As the big day approaches, these delicious, jam-filled flaky pastries would crop up all over Chinatown. In Hokkien (main dialect spoken in Singapore), pineapple is known as 'ong lai' which sound similar to 'come good fortune'. Many of these tart will be consumed during the celebration in the hope that it will indeed a very fortunate year for those who chomped down enough of these, along with other 'lucky' treats. 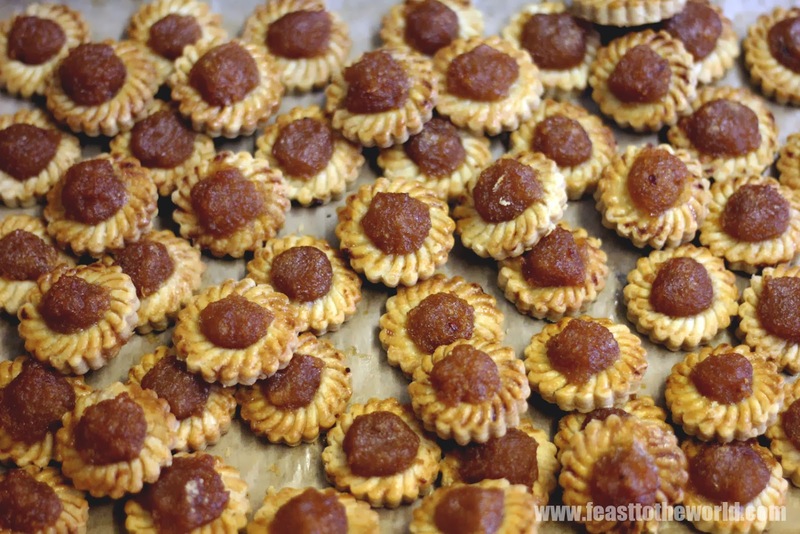 Regardless of whether their polularity are due to the auspicious association, mould of sweet pineapple jam on those buttery pastry base, crumbles as you bit into, are simply addictive and moreish. I dare you to stop at just one, I know I couldn't. These are easy to make once you have the pineapple jam, the laborious part of this recipe, ready at hand. To make life easier, the jam can be made at least a day or more in advance. Be patience when making the jam, it will requires a long and slow simmering in order to caramelise the sugar within the fruits, gradually turning into a golden brown hue. Do not be tempted to turn up the heat or the jam will burn and turn bitter. The consistency is also very important. It will need to be thick enough to be moulded onto the pastry base. Too much moisture and not only will it be trickier to shape but will also mean a soggy tart and the finished pastries will not keep for as long. Make sure you make a big batch of these as they are just too good to be eaten only over Chinese New Year. Even if you are not celebrating the new year, these are perfect for a nibble with a comforting brew. The pineapple jam can be made days in advance. Place the grated pineapple in a muslin cloth or clean tea towel. Squeeze out as much moisture as possible over a large bowl. Do not over squeezed. The pulp should still remains slightly moist. In a large pan, combine the pineapple pulp, star anise, cinnamon, cloves and sugar. Heat gently over low heat, stirring constantly to prevent the jam from burning. Cook until the jam thicken and turn golden brown. This can take anything from 1−2 hours. Remove from heat and allows to cool. Stored in an airtight container in the fridge until required. To make the pastry, sift the flour and salt into a large mixing bowl. Rub the butter into the flour with your fingers until it resemble fine crumbs. In a separate bowl, lightly beat the eggs and the vanilla extract and add this to the flour, a little at a time until the mixture comes together to form a soft dough. Add a touch of cold water if the mixture is too dry. Cover the dough with a cling film and rest in the fridge for at least 30 minutes. To assemble the tart, preheat the oven to 180ºC. Lightly dust the working surface with flour and roll out the pastry into about 0.5cm thickness. 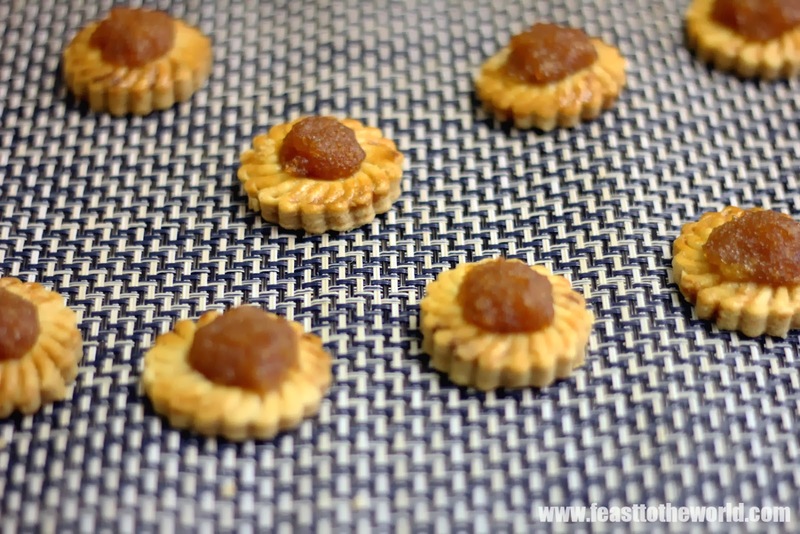 Using a pineapple tart mould, cut out the tart base and repeat until all the pastry are used up. Chill the tart bases in the refrigerator for 15minutes to firm up. 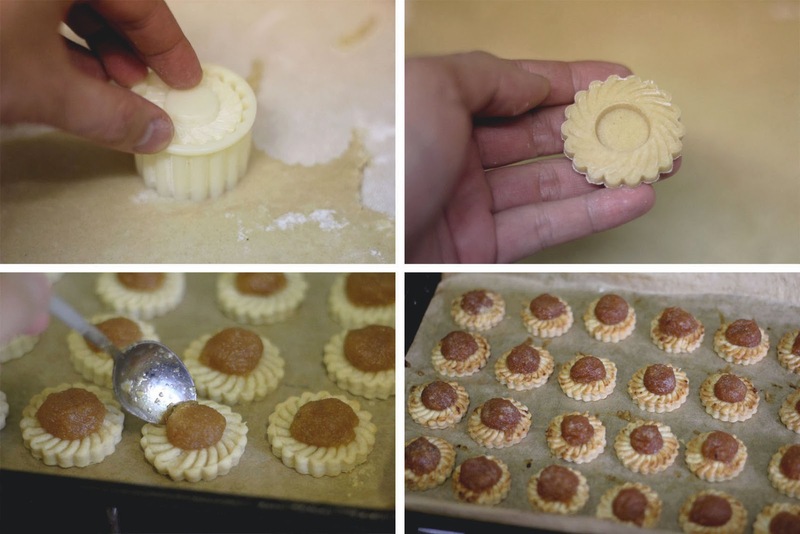 If you do not have a pineapple tart mould, cut out the tart base with a 5cm diameter cookie cutter. Lay the tart bases on a baking sheet lined with parchment paper. Mould a heaped teaspoon of pineapple jam into balls and fill the centre of each tart base with these. Glaze with the beaten eggs before baking in the oven for 10 minutes. After this time, lower the oven temperature to 150ºC and bake for another 10-15 minutes, until the tart turn golden brown. Allow to cool completely before treating yourself to a few of these delicious tarts. Storing the rest in an airtight container.